The antibunching dip of the correlation function is based on the fact that a single emitter can only emit one photon at a time. The process can easily be described using a simpliﬁed two-level energy diagram, where a molecule in an excited state requires a ﬁnite amount of time before it relaxes back to the ground state by emitting a photon. The temporal separation between adjacent photons is therefore determined mostly by the excited-state lifetime. This effect is known as antibunching and represents the sub-Poissonian nature of the emitted light. 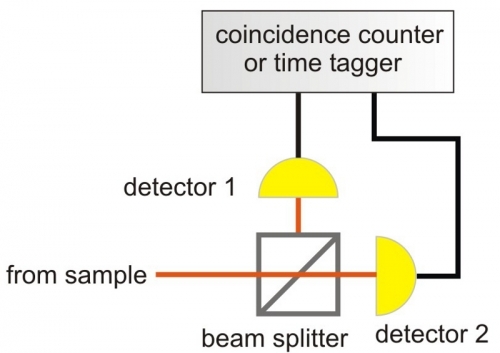 Experiments probing for photon antibunching are usually performed in a Hanbury Brown-Twiss interferometer set-up, in which the emitted light is split with a 50/50 beam-splitter onto two single photon sensitive detectors. 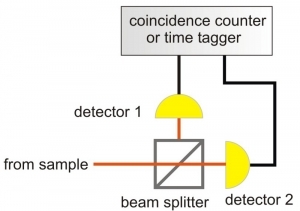 The detector outputs are then connected to a TCSPC (Time-Correlated Single Photon Counting) unit and the time difference between the two signals originating from two emitted photons is repeatedly measured and histogrammed with picosecond resolution. The “stop” channel is usually delayed by a certain amount of time in order to visualize also negative correlations. Antibunching experiments can essentially be performed with pulsed or continous-wave excitation. 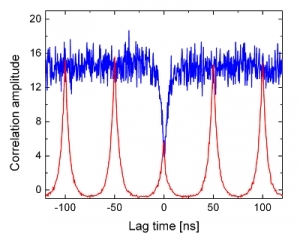 Using continous-wave excitation, the typical result of an antibunching experiment is a flat line with a notable “intensity dip” at a time difference of zero, because a single molecule can not emit two photons at the same time. With pulsed excitation, the result shows the individual laser pulses spaced by the pulse period with a reduced or missing pulse at the correlation time difference of zero. 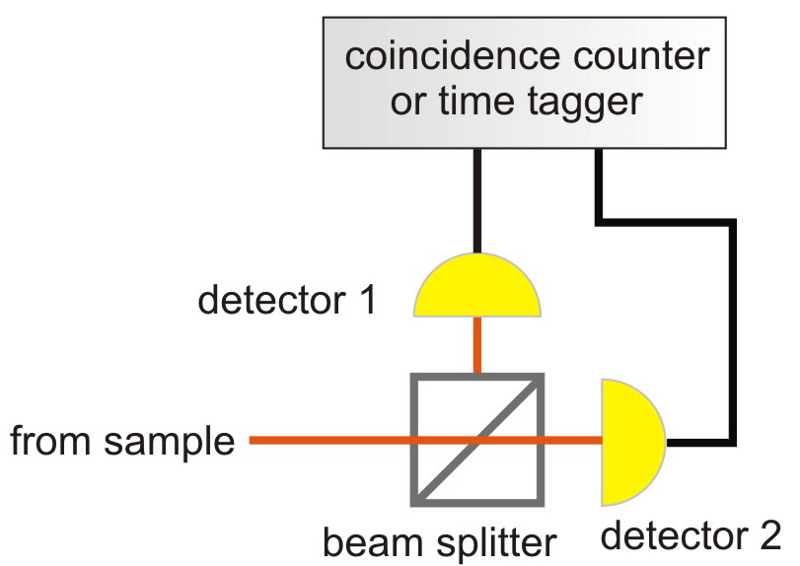 An alternative way to measure antibunching is to time tag the absolute arrival time of all detected photons and then use a dedicated correlation algorithm. 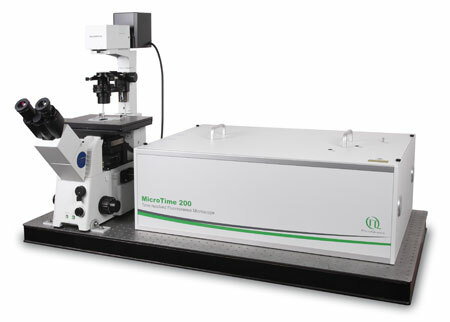 This example shows antibunching measurements of a highly diluted solution of Atto 655 (0.1 nM) in water using pulsed laser excitation. 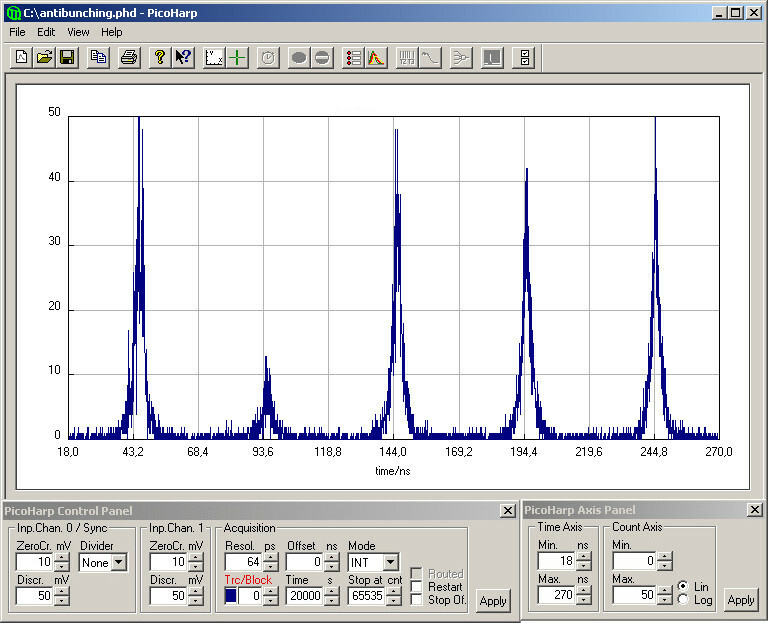 The screenshot shows the results from the antibunching measurements using the standard data acquisition software of the PicoHarp 300. The reduced height of the signal peak around 95 ns due to antibunching can clearly be seen.